This traditional adjustable 325mm LED picture light in antique brass finish features a rectangular wall mount and swan neck arm, with adjustable 13″ cylindrical head. Fitted with non-replaceable cool white (6000k) LED lamps, this traditionally styled picture light is just the job for highlighting pictures, portraits or wall art. It is fitted with an adjustable knuckle joint for directional light to make the most of your precious art and family portraits. The traditional design adds character to any room and the slimline style makes it suitable for contemporary settings too. 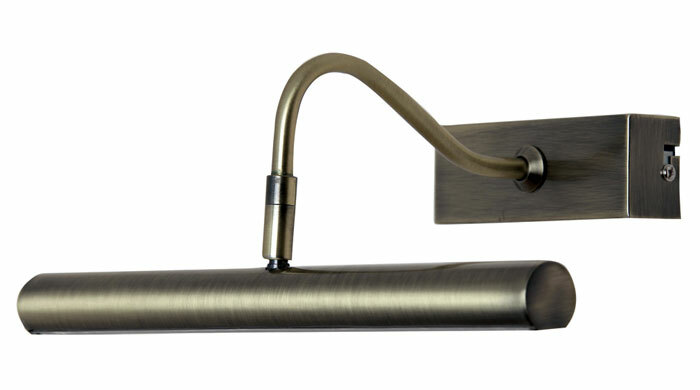 An energy saving slimline antique brass finish picture light, with a rectangular wall bracket, adjustable head and swan neck arm.